The Weerdsprong connects the Maasboulevard in Venlo to the city park at the Kop van de Weerd. 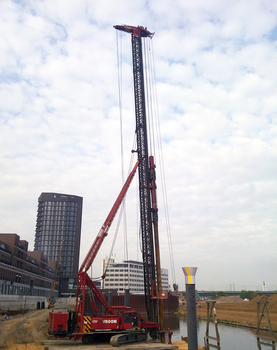 For this project, vibro piles have been produced. Venlo residents gave the most votes to ipv Delft’s design. Through a contest, the bridge was named. Ultimately, the judges picked the name Weerdsprong out of around 1,400 submissions. The Weerdsprong connects the Maasboulevard in Venlo to the city park at the Kop van de Weerd. There were two nominated designs: by ipv Delft and by Royal Haskoning. The design by ipv Delft received 70% out of 2600 votes. This agency designed a modern slim bridge with different references to Venlo’s Roman history. The shape and details refer to the Roman arch bridge. The connecting supporting arches have been constructed in detail in such a manner that they resemble keystones from the Roman era. The bridge makes an important link between the connection for cyclists, and also forms the crossing for pedestrians along the Maas river. 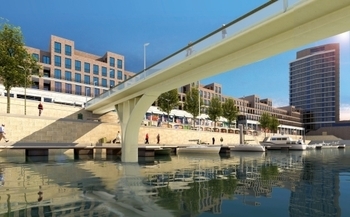 The bridge spans the marina. 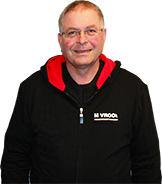 The pictures have been taken by Vroom employee Raymond Rouw. Along with Dirk Jong and machinist Edwin v.d. Giessen, he is executing this project. The cast-in-situ vibro piles have been produced and driven in a vertical position and in slant positions 5:1 and 12:1.